This past weekend felt like our first real summer weekend. There was an outdoor music festival, late night barbecues, balcony drinks amongst friends huddled around a candle, and a few hours relaxing with the new cookbook my sister's bought me for my birthday. Though I accomplished nothing on my weekend to-do list (that seems to be rather typical in the summer months), I was able to tag about half of the book, totally tantalized by her fabulous seasonal recipes. 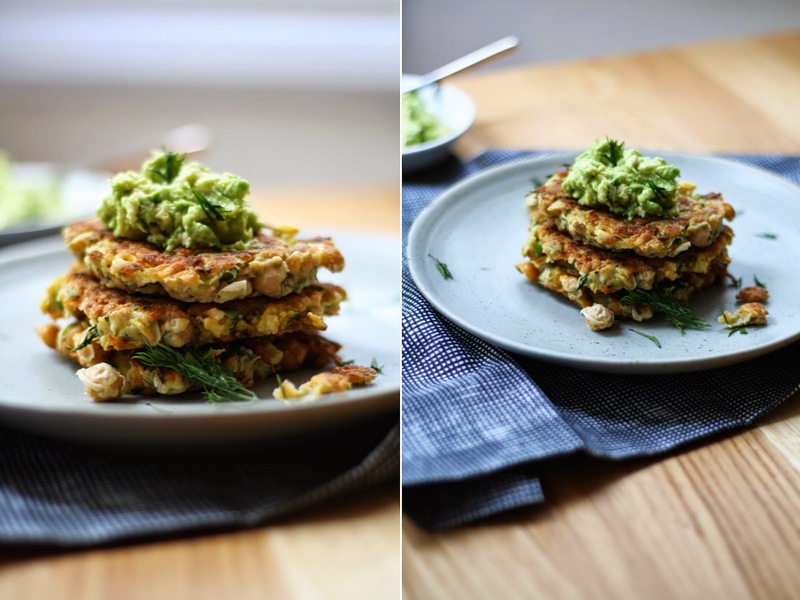 These fritters are a riff on Kimberley's "Sweet Corn and Squash Fritters" -- corn isn't around yet, and I can never get enough dill. Serve with a bed of greens or a side salad, and you have yourself a perfect summer lunch! Method adapted from Vibrant Food. Place the chickpeas in a large bowl, and, using a fork, 'smash' through to create a mash - not totally smooth, but smooth enough. Add the grated squash, chili, onion, dill and salt and toss to combine. In a separate, smaller bowl, beat the egg. Transfer to the chickpea mixture and mix thoroughly. Add 1/4 cup of flour and stir to combine. If mixture is too wet, add a bit more flour. Let the batter sit for 10 minutes. Allow the fritters to sit, undisturbed for 3-4 minutes, then gently flip, and let sit for roughly 4 minutes until edges are golden and crispy. Transfer to a paper towel lined plate. Add another tbsp of oil to the skillet and continue with the same method until you've used up all the batter. Serve warm, with a heaping scoop of smashed avocado and a sprinkle of dill.